The world’s toughest and most waterproof motorcycle luggage system proven by thousands of adventure riders all over the world. 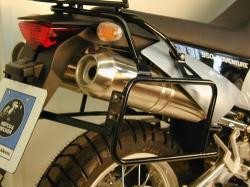 - Fits KTM 950-990 Adventure. Easy to assemble turn-key System complete with cases, side racks, locks, mounting hardware, everything. No drilling or modification to the bike. - Nearly indestructible SKB cases with a heavy duty watertight O-ring lid seal - will not crack or shatter like hard plastic, will not dent & leak like aluminum luggage. - Cases are pre-drilled for optimum performance & safety with pre-installed waterproof lid locks, lid lanyards, and gear retention straps (if you prefer undrilled cases just ask). - Our latch is outside of the case, no need to open case and unload your gear to access pucks or bolts. It is field replaceable and designed to release the case from the bike in a hard crash thereby protecting the bike's subframe and luggage rack. - Single key system - the key on the latch is matched to the case lid lock key. - Super strong Hepco Becker side luggage racks - the best fit and most durable side racks available. - All mount components are made of high strength powder coated steel. No brittle plastic parts holding the case to the bike. - Passenger Friendly Design - plenty of room for passenger's legs and feet on passenger peg.